Objectives:An association of increased risk of ovarian cancer with use of antidepressants or benzodiazepine tranquilizers has been reported from a case–control study. We assessed the association between ovarian cancer risk and the use of tricyclic antidepressants, selective serotonin reuptake inhibitors (SSRIs), phenothiazine antipsychotics, and benzodiazepines, in data from the Case–Control Surveillance Study. Methods:From 1976 through 1998, data were collected from hospital patients in Boston, New York, Philadelphia, and Baltimore based on demographic factors, reproductive and medical history, and medication use. 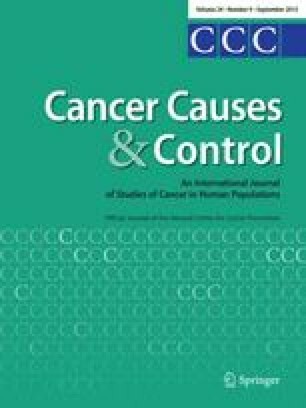 In the present analyses, cases of epithelial ovarian cancer (n = 748) were compared with cancer controls (n = 1496) and noncancer controls admitted for trauma and acute infection (n = 1496). We estimated Mantel–Haenszel odds ratios adjusted for age, study center, and year of interview. Results:Odds ratios for regular use (at least 4 days/week for at least 1 month) were compatible with 1.0 for every drug class. For tricyclics and benzodiazepines the upper 95% confidence limits were less than 1.6. For phenothiazines the upper limit was 2.6 with cancer controls and 1.4 with noncancer controls. Only five cases used SSRIs, yielding unstable results. Odds ratios were not increased among women who had used any drug class for at least 5 years, nor among women who had first used them 10 or more years previously. Conclusions:These data do not support an association between regular use of any of the drugs under study with ovarian cancer risk.